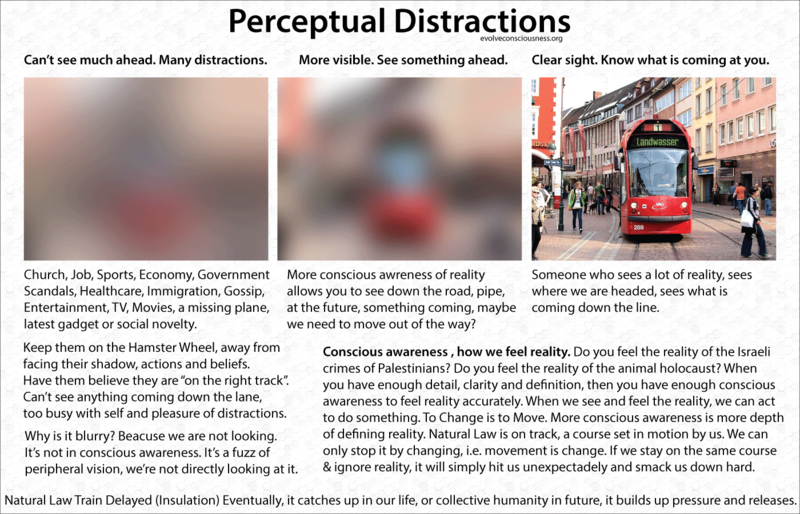 Perceptual distractions are all the peripheral aspects of life that keep us from facing ourselves in the mirror, our shadow, and gaining increased conscious awareness in order for us to be able to feel the impact of reality as it is. Ignorance of reality is unconsciousness, and inhibits accurate feeling of reality. When we feel reality and its affect on us, then we can develop the Care, Courage and Will to to act on that affection. If we are unconscious about evil, we will not feel them, and we will never act to stop them. Natural Law can be likened to a train. If we do not gain conscious awareness to feel the true affect of reality, then we will also not accurately see what is coming at us. This unconsciousness is living in an insulated bubble of reality. This reality is not actual, but perceptual, existing in the Trinity of Unconsciousness: ignorance, apathy and cowardice. Failure to see what is coming down the pipe/line will result in our own destruction. We will destroy ourselves if we continue to be blind to what is actually happening in the world and in ourselves.